On December 1st, at a presentation given by Bob Budd about the Wyoming Core Habitat Plan for sage grouse, it was pretty obvious that the livestock industry has things pretty much locked up with the agencies and politicians. The presentation was given in one of the big, new hearing rooms in the basement of the State Capitol and was heavily attended by agency and livestock industry people. I was there too with Katie Fite, who I work closely with for Western Watersheds Project, and the presentation was being broadcast live over the internet. Wyoming’s Core Habitat Plan is a plan developed under former Governor Dave Freudenthal and it identifies the remaining habitat which supports sage grouse populations and then designates certain areas as core habitat because it supports 85% of the bird’s population. Within the core habitat areas there are voluntary restrictions on development and disturbance to private lands and the federal agencies have tentatively agreed to follow the plan as well. There would be a limit allowing only 5% of the landscape to be disturbed within the core areas. It all sounds good until you start to examine the details and understand there is a serious lack of regulatory mechanisms in place to enforce it as required by the Endangered Species Act. The plan also completely ignores the impacts of livestock grazing on sage grouse and their habitat. Idaho invited Budd to give the presentation so that Idahoans could better understand the core habitat concept and consider implementing it here but it won’t work the same way because Idaho’s threats to sage grouse are different than Wyoming’s. The biggest threat identified by agencies to Idaho’s sage grouse populations is increased fire frequency caused by conversion to grasslands and increases in invasive annual grasses such as cheatgrass and medusa head. For years the BLM in Idaho has intentionally destroyed intact sagebrush and planted the non-native crested wheatgrass in its place. BLM also seeded crested wheatgrass as a very large part of its post-fire “rehabilitation”. This was done in an attempt to increase livestock forage but it merely shifted use to native grasses such as the native poa and others because the cattle don’t like crested wheatgrass which is coarse and high in silica. In these seedings the BLM treats wild lands like farm fields, seeding continuous dense rows of closely spaced forage grasses. These seedings, chock full of crested wheatgrass and not much else, fuel large wildfires. Sagebrush and other shrubs serve to trap drifting snow, and moderate site conditions. Natural gaps occur in native communities, with microbiotic crusts – not thick grass – in interspaces. 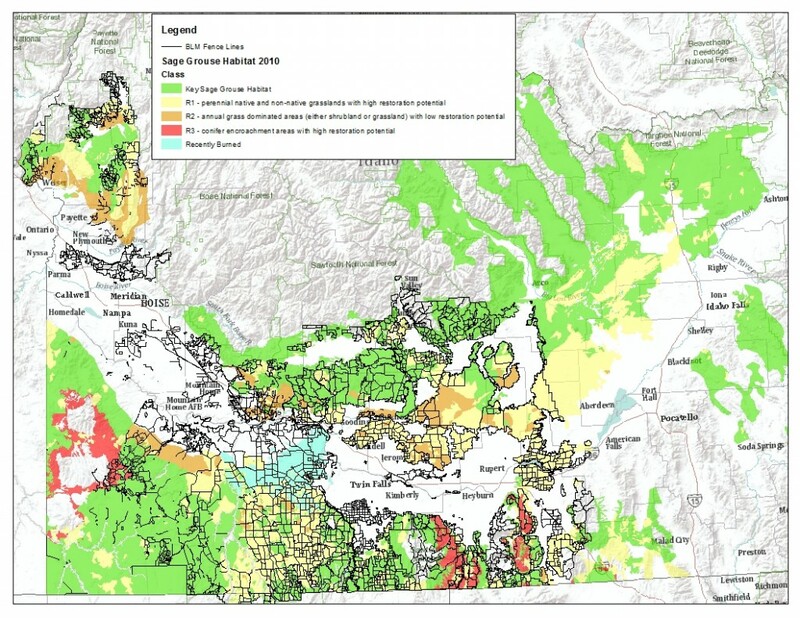 You just have to look at a fire map to see where fire frequencies are high like in the Jarbidge or areas near INL where there have been hundreds of thousands of acres seeded with cwg to see that all of these seedings serve to promote frequent large fires. Just look back to the Long Butte Fire of 2010 in southern Idaho which burned most of its 300,000 acres in just two days. This area contained mostly crested wheatgrass and cheatgrass and had burned as recently as 2007 in the gigantic Murphy Complex which burned over 700,000 acres. Then, range staff set livestock numbers and measure use based on livestock impacts to the tall, dense coarse unpalatable cwg – and not the fragile smaller natives, further promoting damage to natives that remain. Cheatgrass then invades these trampled and degraded areas between the cwg. Cheatgrass and, to a lesser extent, medusahead have taken over large tracts of land in the lower elevations in southwest Idaho. In places where sagebrush remains the entire understory has been converted to cheatgrass making a huge fire hazard which threatens the remaining sagebrush and provides little to no habitat value for sage grouse. Once the area burns it often becomes a monoculture of cheatgrass and other annuals like tumble mustard leaving it to become a virtual wasteland for wildlife and livestock alike. How did it get to this point? Livestock grazing is the big reason for the collapse of the sagebrush biome here. It happened because of the outright impacts of grazing, the management activities such as crested wheatgrass seeding for forage production, the poisoning of sagebrush to increase livestock forage, or roads built for the purpose of managing livestock. All of these things disturbed integral parts of the sagebrush biome and tipped over a threshold. In a natural condition the sagebrush biome has a relatively low fire frequency because, to put it simply, sagebrush doesn’t burn like fine fuels such as cheatgrass and crested wheatgrass. The interspaces are filled with perennial grasses and, most importantly, microbiotic crusts which are composed of algae, lichens, and mosses. These microbiotic crusts are easily disturbed by livestock grazing and other disturbances but form a barrier to seed germination by cheatgrass and other species. Once they are disturbed or removed they take many years, if not decades, to recover, leaving the area vulnerable to non-native cheatgrass and increased fire risk. Plus, establishment of native shrubs is critical to moderating site conditions. Older seedings purposefully destroyed sagebrush, older fire rehab seedings did not seed sagebrush because ranchers hate sagebrush. Even now, following many fires, not all acres are seeded. It is also often difficult to establish sagebrush. What Happens Next. The Cowboy Way. What can be done to stop this cycle? Enter the cowboys and the BLM. Now that they can see the writing on the wall, they are struggling to come up with ways to address this issue without impacting the livestock industry. They have proposed even more disturbance through the construction of “green strips” or “fuel breaks” which consist of mowing sagebrush or tilling up strips of land and leaving it barren or planting seed mixes which contain crested wheatgrass, forage kochia, or other native, but tall, cultivars of grasses. They also want to cut down old growth pinyon and juniper trees to increase sage grouse habitat and they want to do sagebrush “treatments” using poisons like Tebuthiuron or mowing. I have seen several of the “green strips” or “fuel breaks” projects and many of them are not well thought out. The first one I visited in northern Nevada was an eye opener. Katie and I went to meet the BLM who had proposed to mow several wide, parallel swaths through intact sagebrush next to roads to create “fuel breaks”. These new “fuel breaks” were to be part of a larger system of “fuel breaks”, some of which had already been created, in the Owyhee Desert. The area was being heavily grazed during the spring months, as evidenced by the deep cow footprints we saw in the now dry grounds of early December and had little to no grass understory left. There was cheatgrass present in the area, mostly at the base of dead sagebrush plants and next to roads, but it had not yet gotten out of control because it hadn’t yet reached that threshold. Interspersed were small islands of deeper soils which supported clumps basin big sagebrush where pygmy rabbits had dug their burrows. These islands had been largely disturbed by cattle who sought out the only shade available to them but some pygmy rabbits remained. 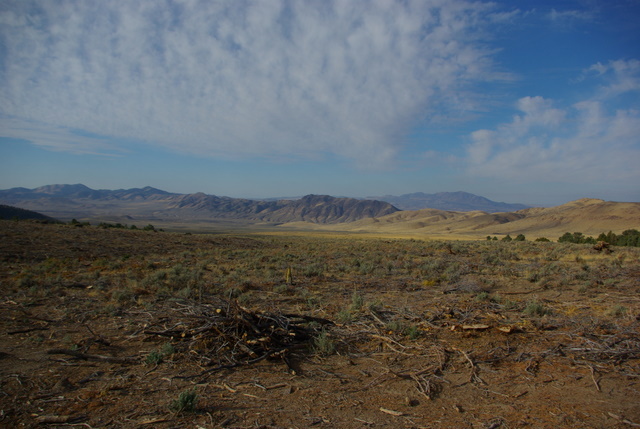 Unfortunately here, the BLM had done no surveys for pygmy rabbits, a BLM sensitive species, and they were going to mow right through the area. We tried to convince them of their folly but they would have none of it. We showed them some of the previous “fuel breaks”, which were well on their way to becoming strips of highly flammable cheatgrass, but they said that they wanted to have “defensible” spaces where firefighters could go to slow fire if it came to the area. Later, after we had parted ways with the BLM, we came across some of the oldest “fuel breaks” that had been mowed in the exact fashion as they were proposing to do for the new ones. They had become monocultures of cheatgrass and the cheatgrass was starting to spread into the adjacent sagebrush habitats. Common sense would tell you that they have just created a greater fire hazard than was already present and that no one in their right mind would want to be anywhere near these areas with an approaching fire. It was a disaster. “Green strips” are also planted with various seed mixes which often contain crested wheatgrass, and non-native forage kochia (Kochia prostrata), which often spread from the areas where they are planted. Once forage kochia has taken root, sagebrush appears to be excluded from growing on the site in the future. Coarse large-sized cultivars of native grasses are at times seeded these days, but are also planted like a dense homogeneous wheatfield, and they too have been bred for large size forage “production” and are not the local native ecotypes. Sometimes “green strips” or “fuel breaks” are even established by heavily grazing an area with sheep or cattle. That benefits the ranchers because there is a mechanism for ranchers to be paid by the BLM for their “services”. I once heard Senator Bert Brackett suggest this type of project for the Jarbidge area. These “green strips” and “fuel breaks” are now being proposed all over the sagebrush steppe in the west but they will have little positive effect even if they are maintained on a yearly basis. The expense involved is high but no one can or will say how high. And, it’s all because the ranchers and BLM will not face the biggest disturbance to the landscape…. livestock. Fire is inevitable, and, as I recently heard from a BLM fire person in Ely, Nevada, the only way to put many of them out is to wait for the direction of the wind to change. Fighting range fires with huge amounts of resources does little to change their behavior and landscapes covered with fine, flashy fuels will burn much faster than intact sagebrush habitats. Pinyon and juniper killing is another strategy being touted by the cowboys and BLM to address sage grouse declines. Because the lower elevation sage grouse habitats have become so trashed by invasive weeds and crested wheatgrass seeding areas, the BLM has started to focus its efforts on higher elevation areas with pinyon and juniper trees. Instead of referring to them as forests they call them “woodlands” and say that they are “invading” sage grouse habitat. In reality, many of these forests are actually quite old and contain trees which are often 100+ years old. 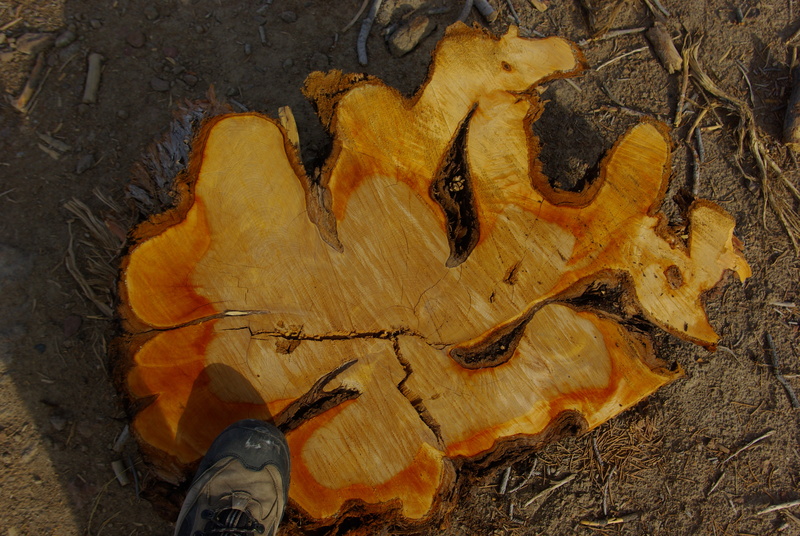 While down in Nevada in October I came across an area where the pinyon/juniper forest had been clearcut and one stump of a tree that I brought home was 180 years old, hardly an “invading” tree. The disturbance here was intense and just less than a mile away, and 150 lower in elevation, was an area with a monoculture cheatgrass from a previous fire. As with other forms of disturbance in the sagebrush biome, killing of sagebrush often results in increased cheatgrass and other annual grasses. I have often seen places, like the Owyhee Desert described above, where cheatgrass isn’t prevalent but thrives at the base of dead sagebrush plants. The reason for this is that the soils at the base of sagebrush build up nutrients and cheatgrass thrives when the sagebrush dies then becoming hotter and drier. 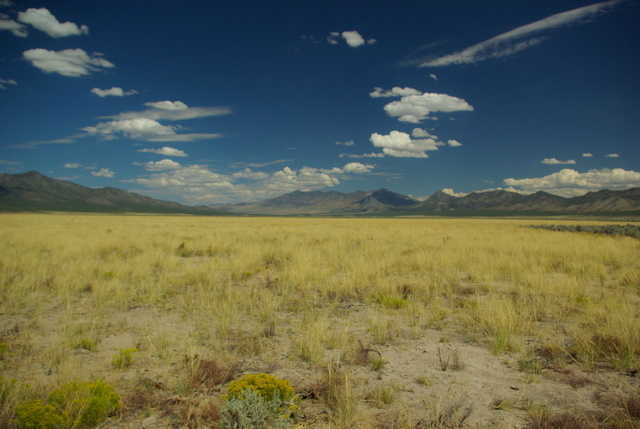 When given an opportunity the cheatgrass can rapidly expand into a landscape and make it unsuitable for sage grouse, pygmy rabbits, and many other species. Also, and more importantly, sagebrush is the core underlying part of sage grouse habitat and it is also critical for many other declining and sensitive species such as Brewer’s sparrow, sage sparrow, northern shrike, sage thrasher, and pygmy rabbit. These species are never considered when management decisions are being made because the agencies myopically only think about one or two species. One of the least considered, but most important, pieces of the sagebrush biome is its microbiotic crusts composed of cyanobacteria, eukaryotic algae, fungi, lichens, and bryophytes (mosses). They are distributed throughout arid and semi-arid landscapes all over the world. Ranchers don’t like microbiotic crusts because in many places which still retain them there is little grass and forb production, and, as we heard at the meeting at the statehouse when Budd said that there are no microbiotic crusts in Wyoming, they even deny their existence in many places. 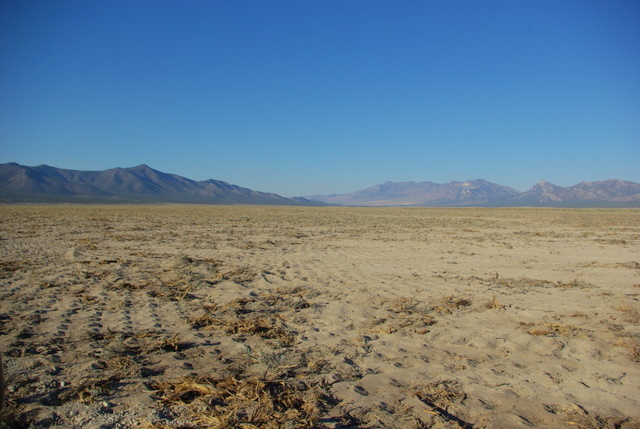 Microbiotic crusts are important for many reasons such as retaining moisture which limits wildfire, providing a layer which deters germination of invasive plants like cheatgrass, retaining carbon and fixing nitrogen for plant growth, providing for infiltration of water, and preventing soil erosion. These crusts are easily disturbed by livestock through trampling and compaction but they take a long time to form so don’t easily recover. Because of this bias against microbiotic crusts ranchers and the agencies target these areas for “treatment” to encourage livestock forage. Instead of calling these treatments forage projects they now call them “habitat restoration” projects. 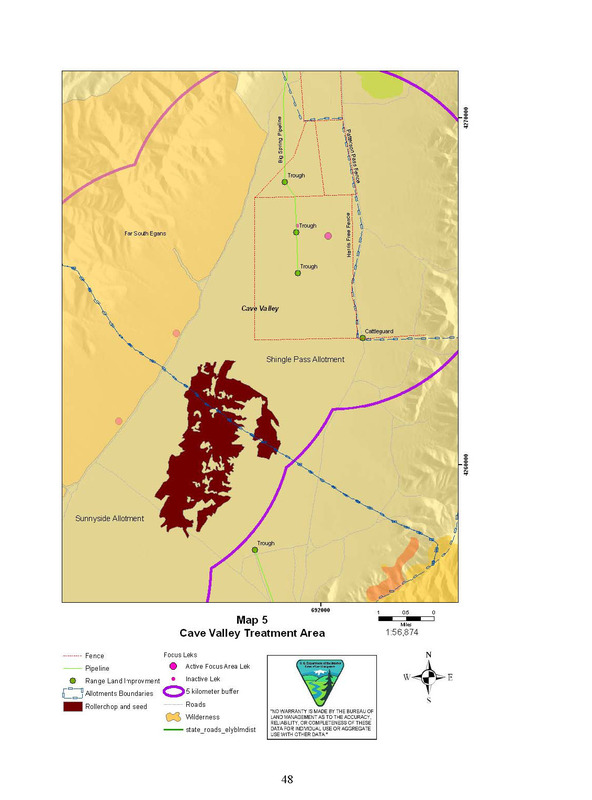 One such “habitat restoration” project I have written about here was conducted in Cave Valley, Nevada. This project was included as part of the Lincoln County Sage Grouse Habitat Restoration Project and was intended to improve “existing sagebrush habitat, maintaining or increasing sage grouse populations, and restoring sagebrush plant communities”. This is not what happened though. 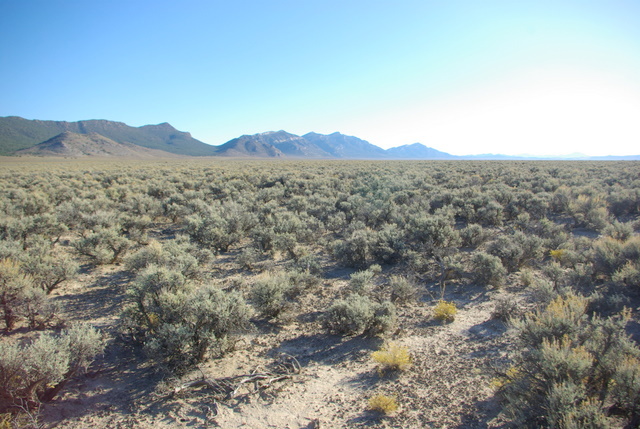 What resulted from this project was complete destruction of microbiotic crusts and sagebrush which was then planted with indian rice grass and other forbs making the area more vulnerable to fire, wind erosion, and even less suitable for sage grouse. It resembles a livestock forage project and cattle had returned just two years after the project was finished. So much of what has been proposed as remedy for sage grouse is to “treat” native vegetation instead of restoring areas that have been converted to non-native species. While there is likely no remedy, short of long term rest, for cheatgrass areas there may be for higher elevation areas planted in crested wheatgrass. Unfortunately these are the places that are ignored by the BLM but were also the most productive areas for sage grouse, now they are sacrifice areas which are heavily grazed. Crested wheatgrass is a non-native grass from Siberia that has been planted as livestock forage for many decades. Stocking rates are based on it but it isn’t very palatable to livestock because it contains high amounts of silica, it’s rough, and “protein supplements are required to ensure good animal health.” Because of this, livestock tend to eat it last because it prefers native grasses which are more palatable. This leaves the landscape with very little in the way of other grasses and forbs. Because of this reduction in forbs, and because it competes for the water that forbs need, the insects that sage grouse chicks need aren’t present in the quantities needed. Crested wheatgrass thrives in arid conditions but it is very poor wildlife forage compared to native grasses, it is also poor sage grouse habitat, especially for nesting and brood rearing. Even if there is sagebrush present in a landscape it provides a poor visual, and even a poor scent shield from predators because of its vertical form. Good sage grouse nesting habitat has grasses like blue bunch wheatgrass, a native bunchgrass which kind of droops making it more difficult for predators like ravens to spot a nest. It also provides a better scent barrier to ground predators like badgers and coyotes. There have been very few projects to restore crested wheatgrass seeding areas and they involve planting sage brush instead of trying to get rid of the grass. Actually though, most treatments in crested wheatgrass seedings are intended to remove sagebrush because it interferes with the sacred cattle grazing. Restoration can be done though. It requires repeated treatments and reseeding of the landscape. Unfortunately, even when attempted, crested wheatgrass is generally never eradicated from a landscape but some semblance of a natural vegetation community can be returned especially if sagebrush, a foundation species which stabilizes the plant community, can be reestablished. Another method of reducing sage grouse mortality is to remove fences. Fencing causes many problems for sage grouse. First, the birds often collide with them and die as a result. Second, the fences provide convenient perches for predators such as ravens and raptors which prey on nests and young birds, even the occasional adult. Third, cattle and ranchers often disturb areas close to fences which can result in increased weed infestations. When the BLM is conducting grazing permit renewals they often seek ways to avoid reductions in AUMs for livestock when they find livestock created problems and prefer to construct various “improvements” such as new water developments, exclosure fences, or pasture fences. It has gotten to the point, in some areas, that the fence density is extremely high and the landscape looks more like it has been industrialized. Sage Grouse Habitat and Fences in southwest Idaho. The data is incomplete, especially for Owyhee County. The last thing that the BLM will ever consider for protection of sage grouse is reduction or elimination of livestock grazing. Livestock grazing is the source of or rationale for many of the disturbances I have described above, yet, the BLM and ranchers have constructed every possible argument they can to divert attention away from this obvious and ubiquitous disturbance across the landscapes of Idaho. It is extraordinarily rare that the BLM or US Forest Service ever reduces actual livestock use on any allotment, even if there are problems associated with livestock use. If there are cuts in livestock they are usually cuts in what are called “paper cows” or cows that aren’t actually grazed but are permitted to graze on an allotment. This results in no actual reduction in impact. The agencies need to seriously consider actual reductions or elimination of livestock grazing on public lands, but, as we have seen recently, they don’t even want to look at these impacts and have done everything they can to deny their existence. Is There Optimism for the future of Sage Grouse? Because of increasing fragmentation of sage grouse habitat across the West it is hard to be optimistic for their future in any ecologically meaningful numbers. Fundamentally, what needs to be done for sage grouse will likely never be considered until a tipping point is crossed and it is too late. The agencies have repeatedly shown that they are incapable of dealing effectively with the threats posed by the actions they approve on their lands and that they have chosen to take a myopic approach to the issue of landscape disturbance and fragmentation. I believe that, short or legal pressure to actually follow the laws and use the best available science, many species will suffer the same fate and the status quo in management will unquestionably result in a collapse of the sagebrush biome. It’s quite obvious that the BLM is almost completely aligned with rancher’s financial interests in the areas you’re describing. Sounds like they will have to be forced into changing from the outside. The question I’ve considered on more than one occasion is whether litigation is the best tool available to force that needed change on the BLM. So far, it does seem like litigation has by far and away bore the most fruit on this issue. What effect it will have over the long term and how much it will contribute to lasting change, I’m less certain, but hopeful. One thing I should have added is the climate change aspect of all of this. Even though the BLM, and all agencies, are required to consider climate change in their decisions, it is rare that they actually consider it seriously. Things are changing on the landscape and it is critical that there is LESS disturbance on the landscape rather than more. Unless they seriously consider reducing disturbance, especially grazing but other forms of disturbance too, then the landscape will continue to unravel. I think it’s important to focus less on climate change itself at this point, and more on trying to preserving or rehabilitating our remaining undeveloped areas. I feel that we’re pot committed on climate change and that there’s no going back, not with the tar sands and China firing up a new coal fired power plant every week. If we can’t have an impact on climate change itself, we can at least try to get the landscape in the best condition we can to weather the storm. You’re right, but if the agencies were considering the issue seriously then they wouldn’t be approving most of the activities they are. Microbiotic crusts–bio 101. Who are these people? surely not scientists or botanists. Every college biology student in the west who has ever taken a field trip knows not to even step on it if they can help it. Thanks for the great informative article Ken. I feel sick reading it, and especially seeing those photos of the sagebrush habitat before restoration and after with no sage brush. Getting cattle off of these lands and leaving them alone for a good 20 years is probably the only solution given these people have no idea about sound habitat restoration. Please note the very small numbers of grouse and/or nests that were actually studied by WS , and the blanket conclusion drawn. Oil companies are by far the most successful example of the “Just do it no matter what and ask for forgiveness later” approach. Every new endeavor is proppped up by the usual caste of characters: profiteers, cowards, bootlickers, and fools. They all play their own roles in helping the oil companies exploit our naturual areas with little real oversight. If they mislead and misdirect just long enough, they can get what they want and move on. Worst case scenario: You shell out some token funding after the fact to throw a band-aid on the gaping wound left in the rear-view. I actually marvel at the commercials I watch telling me about how wonderful fracking is in 30 seconds or less. Thanks for your thorough comments on the situation down in SW Idaho and Nevada. Our habitat conditions in SE Central Idaho are not nearly as bad as yours. They’re not great, but at least we’re not buried in cheat & cwg. Reading your comments makes me think that site-specific variables (weather, soil, habitat fragmentation, presence of invasives, etc.) are so great, it will be difficult to develop a west-wide SG recovery plan. I suspect this presentation came about as the beginning of an effort to head off sage grouse listing in 2015. There is certainly no shortage of money to do SG projects in Idaho, but if I’ve learned anything over the last two years of rangeland tours, it’s that there’s no silver bullet for SG recovery, given the huge number of factors contributing to their decline. Also, given the regulatory hurdles that NEPA presents, and the likelihood (certainty?) of litigation, any projects on public land (where most SG live) will take a long time to implement. Is the term “welfare rancher” still applicable? Been years since I last saw it in print. What a terrific primer. Regulatory capture on the rampage. Thanks Ken. Devastation everywhere at the hands of the BLM and their friends. How can the wild horses be of benefit to the sage grouse? Thank you for all you are doing to help the creatures, plants and land–so uniquely special in the West.